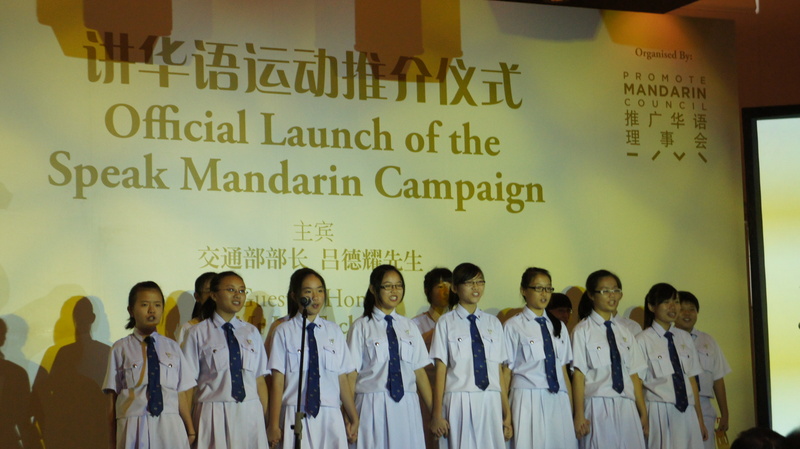 The speak Mandarin campaign was launched at the Asian Civilisations Museum, with a new tagline promoting more frequent use of the language. Flanked by campaign director Seow Choke Meng and MP for Yuhua SMC Ms Grace Fu on his right, Minister for Transport Lui Tuck Yew officially launches the new tagline for the Speak Mandarin Campaign. 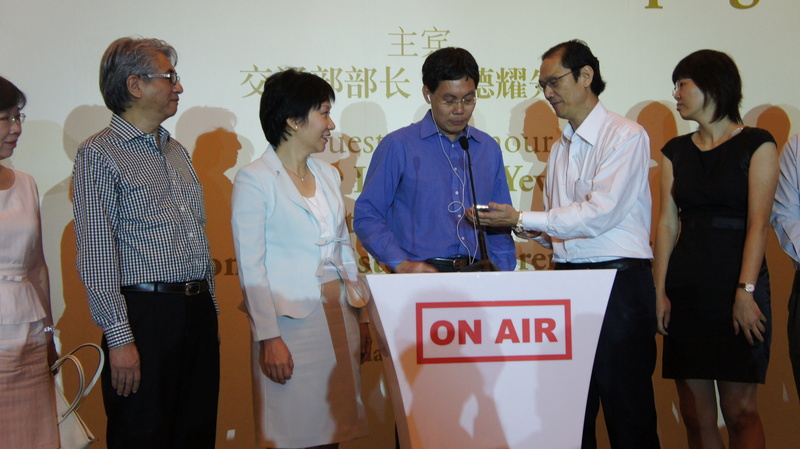 “华文华语，多用就可以” was the new tagline launched at the Speak Mandarin Campaign for 2011, at the Asian Civilisations Museum. And in its 32nd year running, the tagline’s message was clear – Mandarin, it gets better with use. 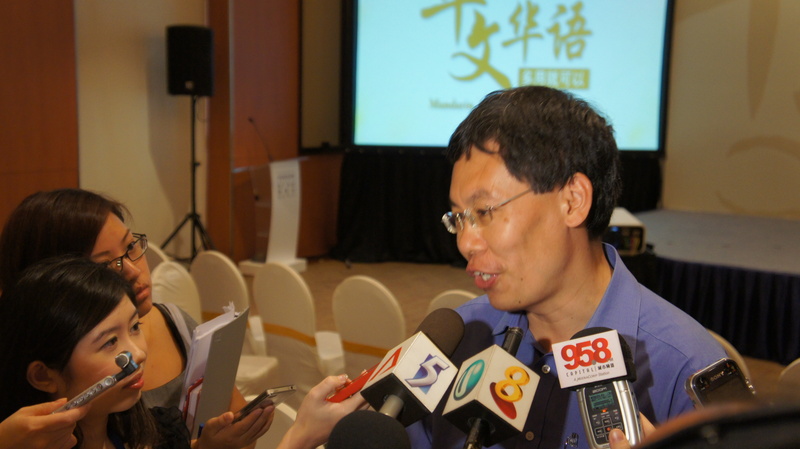 Placing emphasis on the growing need of using Mandarin, the campaign’s newly appointed director, Seow Choke Meng, said, “Due to changes in the current world landscape, more Singaporeans are finding it important to learn Mandarin.” He was referring to China’s growing economic power in recent years and how Singaporeans were capitalising on it with language use. Mr Seow therefore stated that the Government has been encouraging parents to extend the use of Mandarin on a daily basis at home. Minister for Transport and 2nd Minister for Foreign Affairs Lui Tuck Yew, the guest-of-honour for the event, concurred with Mr Seow. “Singaporeans are beginning realise that it is important to transfer knowledge of the language to the next generation,” he said in Mandarin. Mr Lui stated an example of his encounter with a 6-year-old girl he met at a community event, who showed a flair for reciting Chinese poems. “She recited it for me (again). Very very fluently. I said, “You’re wonderful, you’re 6 years old and you know it. I’m nearly 50 years old and I’ve just learnt it.” She said, “I think I learn faster than you,”” Mr Lui laughed. But when asked if she knew the meaning of the poem, she replied, “No, not quite.” Mr Lui felt that in time, if she continues her love for the language, she would eventually understand what he said were the “deep underlying meanings” of these classic poems. But he reiterated that relating the language to the richness of Chinese culture would be a better approach to learning. “In particular, those that have to do with tradition, culture and Chinese poetry, for example,” continued the Member of Parliament for Moulmein-Kallang GRC, who confessed to reading Old Master Q, or Lao Fu Zi comics as a springboard to learning Chinese. As much as he acknowledged the fact that the education system was moving towards alternate methods of teaching, with games and activities, he still felt that rote learning and memorising should not be completely phased out. “There are still things worth memorising,” he said, referring to Tang poems, which he described as “20-word passages with full of meaning”. Students from Chung Cheng High (Yishun) performing a poem recital as part of a series of performances during the conference. Still, these alternate forms of learning and expressing love for the language are still the main draw of this year’s campaign, with its SMC Song Contest Aimed at encouraging Chinese Singaporeans to appreciate the Chinese language and culture, winners of the competition will be awarded with training sessions and masterclasses by local composers, in the spirit of nurturing fresh young talents for the local music industry. And the fun doesn’t stop there. There is the Chinese Challenge, a quiz competition posing questions relating to Chinese history, pop culture and general knowledge, which will have its Grand Fianls aired on MediaCorp Channel 8 this September. Finally, a new initiative in this installment of this campaign will have aspiring filmmakers something to cheer about, with a Short Video Clip Competition. Contestants will have to feature facets of the Chinese language and culture in this competition. Cool Culture, Are You Game?